Governor of the US State of Kentucky Matt Bevin will lead a high-power American business delegation, comprising representatives from top companies, for the next Vibrant Gujarat Global Summit in January. The delegation of US Chambers of Commerce, which includes the US-India Business Council (USIBC) and co-leaders of the Kentucky Cabinet for Economic Development, will strengthen ties with national and state government leaders, industry groups and individual businesses in one of the world's largest and fastest growing economies, the governor's office said. 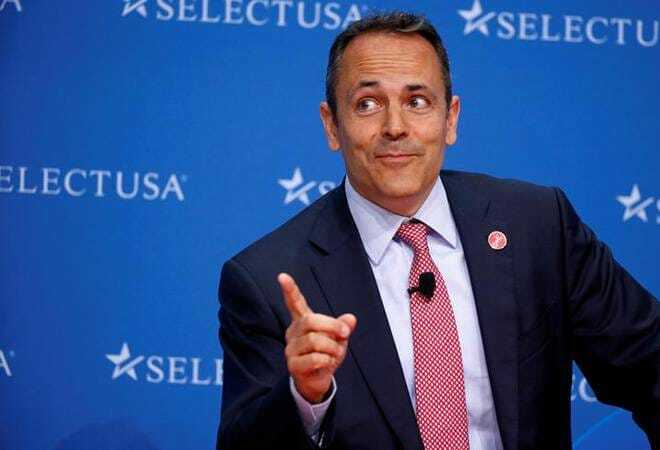 "Kentucky is excited to explore opportunities within the Indian market and to meet with key government and business leaders during next month's business summit," Bevin said in a statement on Monday. "Our state is a leading exporter of food products as well as healthcare and engineering technologies. This trip is an incredible opportunity to showcase Kentucky's growth as an epicentre for global companies," Bevin said. The delegation will help increase awareness about trade and investment opportunities between the US and India, he said. After Gujarat, the delegation will also travel to Uttar Pradesh to participate in industry meetings surrounding Pravasi Bharatiya Divas. Nisha Biswal, president of the USIBC, said the organisation would deliver a productive and impactful engagement for Kentucky and the USIBC members at Vibrant Gujarat and in Uttar Pradesh. "It is an honour for USIBC and its members to welcome a close partnership with Governor Bevin and the State of Kentucky to lead a delegation of US companies critical to the growth of the US-India bilateral trade and commercial relationship," she said. "Kentucky and India have enjoyed a longstanding partnership, which has resulted in job creation and expanded business opportunities for both Indian and Kentucky companies," Biswal said. Kentucky Cabinet for Economic Development leaders Terry Gill and Vivek Sarin will join Bevin, as will Cabinet's executive director for international affairs Erran Persley and business development, a media report said. Indian companies own in whole or part five facilities in Kentucky, which currently employ approximately 1,625 people. In addition to those five facilities, Novelis earlier this year broke ground in Guthrie for a 125-job aluminium rolling mill, which is scheduled to open by 2020. And this summer Novelis announced it would purchase Aleris Corp, which operates an aluminium rolling mill in Lewisport employing nearly 1,000 people. The deal is scheduled to close in 2019. Together, those will push Kentucky's Indian-owned facilities to seven, employing about 2,750 people, the Governor's office said.